Only in Hollywood could a gripping, interesting, real-life story be turned into an over-dramatized soap opera more reminiscent of The New Guy than a high-energy Vegas flick. Maybe this review will have some naysayers crying that The Movie Mind is a hypocrite. I can’t bash one film for pandering to the literary crowd in a novel turned-film and then in the same breath wish another film was more like its hard-covered counterpart, can I? In this case, yes I can. As hard as it may be to believe, I read Bringing Down the House by Ben Mezrich after it first came out. I don’t read much, but if I can’t get through a book about card counters and Vegas high-jinks then I’m dumber than I thought. I suggest anyone who hasn’t read it give it a try. The book is so interesting you will forget you are actually reading. Unfortunately during this film I found myself wishing I was reading it all over again instead of watching it’s destruction on the big screen. Keep in mind, if this movie fabricated the story by making it MORE interesting than the book, I would have had no problem with that. Remember, The Movie Mind is not like the others; I simply want a great film regardless of any book tie-ins or sequel/prequel stories. Based on what I knew already about the story, there is no reason this shouldn’t have been one. You may now be wondering how this movie could screw up such a great true-story. The recipe is simple: remove all the facets of what made this such a compelling story and turn it into just another relationship/revenge flick, as if there aren’t enough of those. In the book, the kids were extremely intelligent, but that had little to nothing to do with why they were successful. 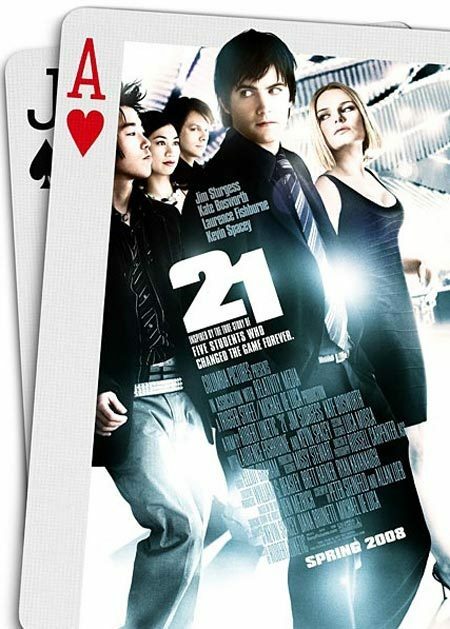 The movie makes too much about Ben Campbell’s (Jim Sturgess) intelligence when in reality any one of us could learn the counting technique with some practice and tutelage. It was their bravado and ability to play a role, similar to a refined actor, that made them successful. The movie shows very little of this transformation and turns Ben Campbell into such a scared, frail, nerd who stutters at the sight of a cute girl that it is almost impossible to buy him acting as “the big player” in Sin City. Then the film turns Ben’s motives for counting cards into a heroic story (he wants to go to med school but can’t pay for it and doesn’t want to take his mom’s life savings) providing him with greater motives than what any of us would have gotten sucked in for: money and the high life. Finally, while there was some controversy about the professor and head of the MIT Blackjack Club, there was no reason to turn the part (played by Kevin Spacey) into the evil villain when in reality he gave these kids the opportunity to get rich quick and enjoy the good life. 21 left out so many of the best parts of the book it is hard to look past. Yet while still approaching the film with the standard Movie Mind mentality, I was willing to overlook it all if for the right reasons. Instead, the movie gave way to front row seats at high profile boxing matches and trips to Bermuda (and subsequent run-ins with bad dudes), AC, Mississippi, and more, for the benefit of developing a love story and double-cross Hollywood style finish. As for the remaining details, the acting was adequate and the frantic camera-work attempts to make up for the excitement the writing didn’t deliver. If nothing else you will leave this movie surprised, more-so if you actually have read the book. Unfortunately, this was one film that could have been great if they stopped worrying about the surprise ending and simply told the story. I did my best to leave the book at the door before watching this film since I had simply hoped for a story as exciting as what I knew about it already. I wouldn’t be doing my job right if I didn’t relay my disappointment to the readers, book or no book. Interesting Cameo Appearance: Jack McGee (Chief Jerry Reilly from Dennis Leary’s Rescue Me) as Terry, partner to professional intimidator, Cole Williams (Laurence Fishburne). Ben Campbell: Winner, winner, chicken dinner. Miles Connoly: You should ask her out. It’s not like she’s a rocket scientist. Oh wait, she is. Micky Rosa: I said Google, not Sizzler. Cole Williams: If I see you in here again, I will break your cheekbone with a small hammer. And then I will kill you. Ben Campbell: I’m not the same guy I was back in Boston. Kianna: Dude, I lost track 20 cards ago. Micky Rosa: Don’t call me dude. perfect product placement from Google – brilliant marketing from the recruitment team – kudos to them !